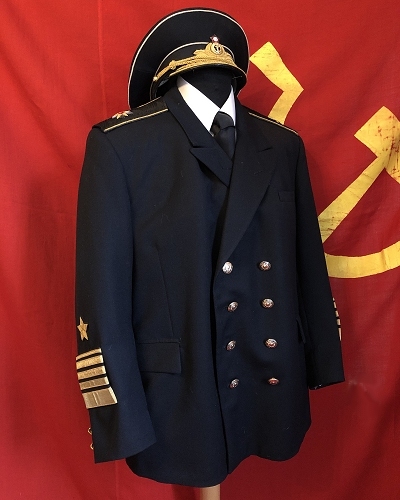 Classic daily dress uniform of the best naval tradition for the rank of Admiral Flota, the second highest rank in the Soviet navy, second only to the Admiral of the Fleet of the Soviet Union. The rank of Admiral of the Fleet was the highest naval rank of the Soviet Union from 1940 to 1955 and second-highest from 1962. The rank of Admiral of the Fleet of the Soviet Union was instituted in 1955, making the history of the highest ranks in the Soviet fleet rather confusing. The uniform is a typical admirals dress uniform with the double breasted button style. The buttons are marked '90' making this uniform a very late Soviet era attire. The shoulder boards are black with one large admirals star, equivalent to the size of the marshal rank stars. Apart from the shoulder boards and the sleeve ranks, the uniform is lacking further decorations and embroideries, as correct for the daily uniforms. The sleeve ranks are made from separately attached rank pieces and an embroidered star. All front buttons including the cuff buttons on the uniform are present and feature the state seal of the USSR in the admiral/naval version. The lining is fine silk and show little wear. Although the set is unnamed, based on the size and year of the uniform - plus the fact that there is a trace from a Hero of Soviet Union title being worn, it may be plausible this uniform belonged to Fleet Admiral N.I. Smirnov who was promoted to fleet admiral in 1974 and passed away in 1992. The visor cap is 1981 dated and manufactured by the 43TsePK factory in Moscow. The cap is a parade version rather than service version, yet goes along well with the uniform. The cap and trousers show less wear than the uniform tunic.